Chellangode, Meppadi Wayanad, Kerala, India. Use the form below to inquire about Kerala Style Resort At Chellangode . Use the form below to reserve for Kerala Style Resort At Chellangode . Ceiling Fan, Hot and Cold Running Water, Room Service, Tea/Coffee Maker, TV with cable connection in each rooms. Ceiling Fan, Hot and Cold Running Water, Laundry Service, Room Service, Tea/Coffee Maker, TV with cable connection in each rooms. Ceiling Fan, Electric Kettle, Hot and Cold Running Water, Private Balcony/Verandah, Room Service, Tea/Coffee Maker, TV with cable connection in each rooms. Kings Plazzo has a double and a single bed and is a very spacious room. Hot and Cold Running Water, Room Service, Tea/Coffee Maker, TV with cable connection in each rooms. This Kerala Style Resort at Chellangode is a plush hideout named after the thundering waterfall whose course flows along its premises. From atop the watchtower, witness the panoramic treat of mountain ranges rising up to the sky, a shimmering silver lining of light adorning the borders of the Western Ghats, enchanting mist melting against the trees, and clouds floating below your feet with the tea gardens all around. This 250 acres of natural splendor is blessed with a placid stream flowing gracefully, soothing the frayed senses of weary travelers. You will be left with no choice but to let go of all the stress you carried here from your busy lifestyle in the city. This Kerala Style Resort at Chellangode is the perfect retreat to lose yourself in thoughts and find inner peace. 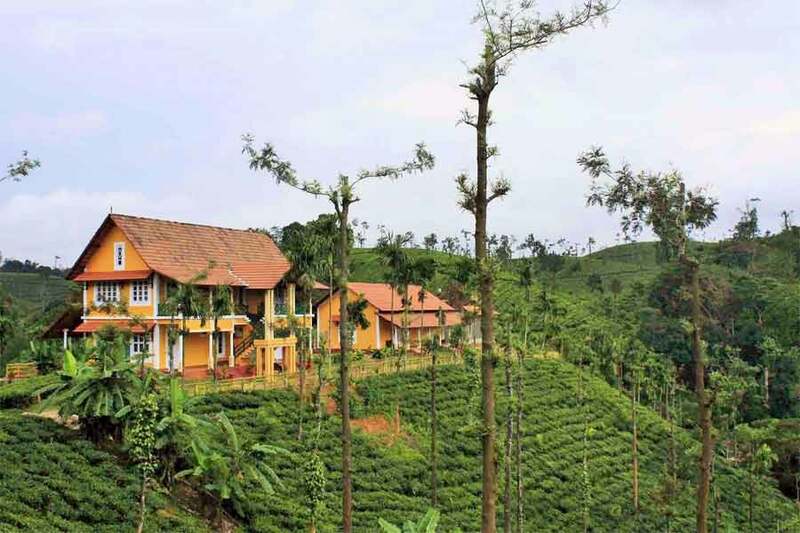 Tucked right into the middle of a tea estate, the rooms at this Resort are flooded with stunning scenery at all times. The exterior reflects traditional Kerala architecture while the interiors have been done in amber and earthy tones. Modern day amenities like televisions and a mini fridge add to the experience amidst world-class hospitality. Guests can choose from three packages, each with a unique combination of offerings. The “Tea and You” package comes with a pavilion studio accommodation, welcome drink, fruit basket, all meals, Ayurvedic massage, guided jeep safari through a plantation, tea factory visit, guided natural walk, cycling through tea garden, campfire, use of swimming pool and games facilities, waterfall visit, and parting gift. The “Coffee and You” package excludes lunch and Ayurvedic massage while including the rest. “Strawberry Honeymoon” package is an up gradation of the Tea and You package with a candle light dinner, honeymoon cake, and flower bed decorations added. The vegetarian and non-vegetarian Kerala delicacies prepared with organic supplies from the home garden will satisfy every palate. The restaurant also indulges guests with custom orders. The blue tint in the atmosphere intensifies as night falls while the bonfire adds charisma to your unforgettable evening here. Meal Rate for Adult is Rs. 500/- per Head for Lunch or Dinner. Child Meal Rate is Rs. 300/- per Head for Lunch or Dinner. Summer rates are from 01 April 2016 – 30 September 2016. Winter rates from 01 October 2017 – 31 March 2018 - Peak season supplement (21st Dec 2018 to 05th Jan 2019) : Rs. 1000/- per room, Christmas and New Year charges ( 24th December 2018 & 31st December 2018) : Rs. 750/- & 1250 per pax, respectively, child @ Rs.400 & 750/- per pax, respectively. Get under the sparkling waters of the in - house waterfalls, an experience that cannot be described in words. Venture out on a cycling trip through the terraced locality as you soak in the pureness of air and nature’s splendid charm. Local sightseeing spots are in abundance around the Resort. At the Edakkal Caves, watch the new Stone Age pictographs, indicative of the existence of civilization during prehistoric times. A trip to Soochippara Waterfalls not only allows a spectacular podium point for bird watching but offers water adventure opportunities in the pool below. Uninhabited Kuruva Islands are perfect for exploring the rainforest. Enjoy a boat ride through the tranquil Promote Lake or in the reservoir of Banasura Dam. Ambalavayal Heritage Museum, Muttanga WildlifeSanctuary, and Thusharagiri Waterfalls are other spots that you might want to visit. Campfire with recorded music and dinner under a sky of myriad stars is the perfect setting for a captivating evening amongst your friends and family. On prior requests, local tribal dance performances, Kalaripayattu shows, and other Kerala art performances can be arranged. Calicut is the nearest airport at a distance of about 120 km (appx 2.5 hrs). Travel on NH766 till Chundale. After crossing Chundale, drive on SH 29 till you reach Vaduvanchal, crossing places like Meppadi and Podivayal. The Resort is located at Vaduvanchal. Stay: Kerala Style Resort At Chellangode Address: Chellangode, Meppadi Wayanad, Kerala, India.